Have you been inspired by an organization that isn’t in your area yet? Or are you hoping to found your own nonprofit, but aren’t quite sure how? Before establishing a completely new association, consider founding a new chapter of an existing organization. Whether you’re part of an existing nonprofit who wants to expand, or are just getting into the world of nonprofit organizations, starting a new chapter of an organization gives you the chance to help out your community, with their support and experience available to guide you. However, I do have one caveat. Setting up a nonprofit, even a new chapter, is a lot of work, and I’ve seen a lot of nonprofits fail because the founder didn’t realize just how much work was involved. Although establishing a new chapter will be slightly less labour-intensive than planning a nonprofit from scratch (for reasons I’ll discuss below), you can still expect to spend 40-60 hours per week getting your chapter off the ground. But if you’re ready for that kind of commitment, read on! 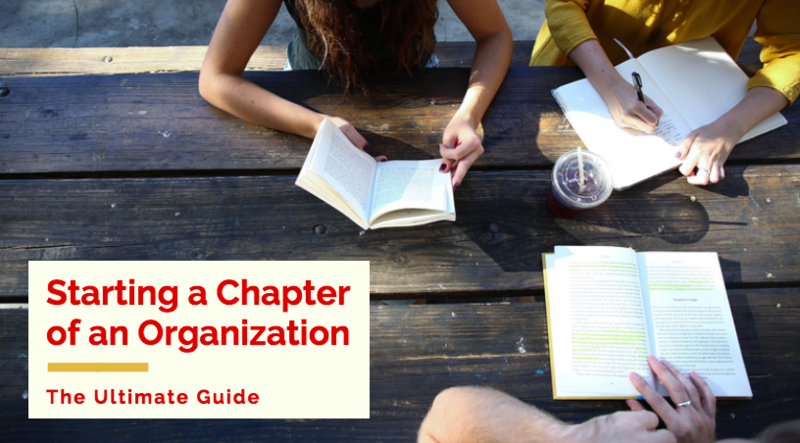 What is a Chapter Organization? A chapter-based organization is any organization that has local branches in multiple areas and shares a mission. This can include a variety of organizations, from sororities to professional associations to nonprofits, and they can be national, state-wide or regional. Multichapter nonprofit organizations operate similarly to franchised businesses — which, if you’ve ever been to Dairy Queen or Denny’s, you’ve experienced firsthand. Just like a for-profit business, the parent organization will copyright its name and create a licensing agreement with the chapter, who will then work to carry out its mission, find new members, and other day-to-day operations. For the most part, chapter organizations are established under the umbrella of the parent organization. They will have their own board, and operate independently, while remaining their own entity. However, depending on the organization, the parent organization will want to have more or less say in the way these activities are handled, and might want to help appoint a board of directors. For more information on the legal implications of each different form of chapter, check out this article. 1. Not being the new kid in town. Imagine you’re visiting a new town and you see two burger joints. Would you be more likely to go to the McDonald’s you recognize, or the unknown one? Most of us would choose the McDonald’s simply because it’s familiar, and this same principle applies for nonprofit chapters. Working with a well-known nonprofit can make it a lot easier for you to get donations, employees and volunteers. Your audience will already be familiar with your mission, and since they already know what to expect, they’ll be ready to jump in and help. 2. Not having to write your own rules. Establishing policies to cover every situation your nonprofit could face is a daunting task, particularly since you might not even be able to imagine some of the things you’ll have to account for right off the bat. That’s why having a standardized policies and procedures document from the parent organization that already covers existing chapters will save you a lot of time. For some great examples of the policies you’ll need to keep in mind, check out this list. 3. Getting a leg up. New nonprofits face a lot of challenges, from getting funding to finding members. However, if you start a chapter of an organization that already exists instead, you’ll get help from a well-established parent organization who will help guide you through the early days. What Organizations Can You Work With? Many organizations have chapters, and many of them have specific rules around founding a new one. A history of working with them or with other nonprofits can help you get your foot in the door, particularly if they’re a larger, more established nonprofit. If the organization you’re interested in isn’t on this list, never fear! Many organizations have chapters spread nation- or state-wide, but it can be difficult to identify which are open to establishing chapters. Do a little research to see if they have existing chapters, and if so, reach out to the parent organization to see what the requirements are. The nonprofit database at Guidestar can also help you figure out which nonprofits are open to starting a new chapter, and who you can reach out to. Once you’ve decided which organization you want to start a chapter of, it’s time for the fun part: actually getting your chapter off the ground! Each parent organization will have different requirements, but there are a few things you can expect to do when you’re starting out. First, you’ll need to agree on a chapter affiliation agreement with the parent organization. Like I mentioned earlier, every organization will handle forming chapters differently. So, preparing an affiliation agreement that outlines all of the expectations they have is key to avoiding misunderstandings down the line. The exact agreement will depend on the organization, but including these provisions at a minimum will keep both your chapter and the parent organization on the same page. Next, your new chapter will need to obtain an EIN — an Employer Identification Number — from the IRS. This will identify your chapter’s tax account, and allow you to accomplish legal responsibilities such as paying employees and opening a business bank account instead of needing to use your PIN. Once you have the requisite documentation, you can apply online. Since your parent organization has already filed with the IRS for tax-free status, you won’t have to. However, they will have to file for your exemption status under the group exemption rule. This will likely also be included in the chapter agreement. Getting board members is one of the most important steps in any nonprofit’s journey. I’ve seen the difference having an engaged board makes — and trust me, it’s a lot. When your board is on board (pardon the pun!) they can help build connections within your community, raise funds, and govern your chapter much more effectively than you could yourself. Ask your parent organization if they know of any contenders. Reach out to the chamber of commerce in your area, as well as local leadership programs or incubators. Ask other volunteer-based organizations with similar missions how they found their board members, and if they know of anyone else who might be interested. Join nonprofit LinkedIn or Facebook groups to reach out to candidates. Finally, depending on your area, sites like The Board Match, BoardSource, and boardnetUSA are also valuable resources for your search. For more advice on setting up an effective board, check out this blog. For more information on these jobs, check out this list of sample job descriptions. What kind of office equipment is required? What’s your budget for acquiring supplies? What kind of assistance will your parent organization provide? To learn where you can get donated or discounted furniture and office supplies for your chapter, check out this blog. I know of some nonprofits who’ve also managed to get donated office space — so if you’re beginning to build connections in your community, it’s worth asking to see if any businesses have space available. Building up your online presence is one of the easiest ways to increase your chapter’s visibility and attract new members to your cause. Including pages that describe your mission, having an events calendar, and any other information that new members or donors would want to know is key to show that you’re a reputable organization and are ready to execute on your mission. Your parent organization will probably also have guidelines to follow, or even a template that you can use when creating your website. Members are the lifeblood of your chapter… but when you’re just getting started, recruiting them can seem impossible. However, never fear: if you have enough determination and are ready to provide value to your community, you should have no problem recruiting the right members. For some advice on retaining members once they’ve joined, check out this post. If you’re worried about the administrative upkeep of running your chapter, consider looking into chapter software. If you’d like to learn more, feel free to reach out to us. I hope all of these steps have given you the guidance you need to start a new chapter of your chosen organization! Comment below if you have any other questions, or think there’s anything I missed.